My daughter found her first loose tooth last night! She is beyond excited. And she immediately became very worried that her tooth might become lost under her pillow and that the tooth fairy might not be able to find such a small tooth. So this called for immediate action on my part which resulted in a rather homespun pouch in which to put the tooth when it finally lets go for good. I completed this project in under 30 minutes using scraps of things I had around the house. I could have made this little pouch much prettier if I had gone shopping for supplies. But always remember, free is good! One other thing to note is that the color in these photos is not true. What appears to be red is really a much mellower pink which does actually coordinate with the light pink ribbon. So try to not be too distracted by the colors. What you will need is some felt, some ribbon or lace (about 18 inches), some thread, a button, a hand sewing needle, and some straight pins. You could instead of sewing this pouch by hand, use a sewing machine, or even just glue for a no-sew project. First I cut a 2 1/2 inch wide strip of my white felt. I love my rotary cutter. Since you are not finishing the edges, you will want a nice straight cut. Next I cut my now 2 1/2 inch wide strip of felt into a three inch rectangle and 4 1/2 inch rectangle. The smaller one will be the front of the pouch and the longer one the back and top flap. Then I cut a small rectangle of my pink felt. Folding it in half, I cut out a small heart. I needed to trim down the size of my heart a couple of times so that it fit nicely on the front pouch piece, far enough away from the edges so that the heart didn't get sewn up in the stiches around the outside edge of the pouch. Next I hand stitched the heart to the front piece of the pouch with a needle and tread to give it a homespun look. Again you could glue the heart in place or machine stich. Pin the gathered ribbon to the inside of the front pouch piece arranging the gathers evenly around the felt piece. I used silk pins because the are long, very thin, and sharp. 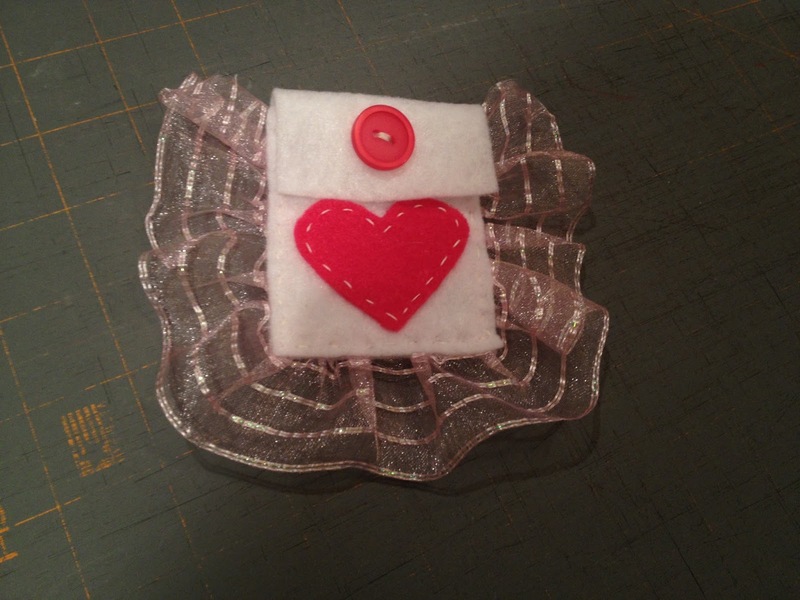 I use these pins for applique work too. As you can see below I had about 1/4 of ribbon overlapping the felt piece. You want to make sure that when you stich (or glue) the front and back felt pieces together that you catch all the ribbon. Now turn over the front piece and carefully lay it on the back felt piece, lining up the edges. Pin through all the layers in a couple of places and stitch (or glue) around the three sides, leaving the top open. I hand stitched the layers and checked with each stitch that I was catching the back and front with each stitch as well as the ribbon. Next I sewed the button in place at the top of the front felt piece. Make sure you do not sew the button to the back piece or the pouch won't open. Then I made a small slit in the flap (which is part of the back felt piece) with scissors for the button hole. Since this is felt (and because this pouch isn't going to get a lot of use) I didn't finish the button hole but you can if you want to. That is really cute. I am sure she will cherish it. I had a little tooth pillow that was actually a birthday party favor at a friend's party in kindergarten. Her mother made one for each child who attended, can you imagine? That was really nice of her. My son gets a little bag to hang on the outside doorknob of his room when he looses a tooth; he's too light a sleeper for me to feel comfortable going into his room to retrieve a tooth and leave money under his pillow! You need an excellent job with supplies on hand. I know your daughter loves it and now has a special place to leave her tooth for the Tooth Fairy. Come link up with me for WW! What a cute little tooth fairy pouch. :) My kids are older teens now, but we used to have a lot of fun with tooth fairy visits, glitter and all. Fun times! How very sweet. My mama made my sister and I our very own tooth pouches. This inspires me to make them for my own kids! Why haven't I yet?? Linked up next to you at Imparting Grace link-up. This is so adorable, was just talking about this yesterday as a friend's son is ready to loose his first tooth. Thanks for sharing on Wildcrafting Wednesdays! I hope you'll join us again and share more of your awesome posts in the future. Too cute! Thanks for sharing on The HomeAcre Hop!